NBA gambling odds: Who has the edge for MVP? Who has the edge in the MVP race? With Kevin Durant sidelined, it appears to be a two-man competition between James Harden and Russell Westbrook. Not even a career-high 58 points from Russell Westbrook was enough for the Thunder to avoid a 126-121 home loss to the Blazers on Tuesday. That lone game may doom Westbrook’s chances of earning NBA MVP honors for the first time in his career because it underscores the biggest issue in his candidacy—winning. 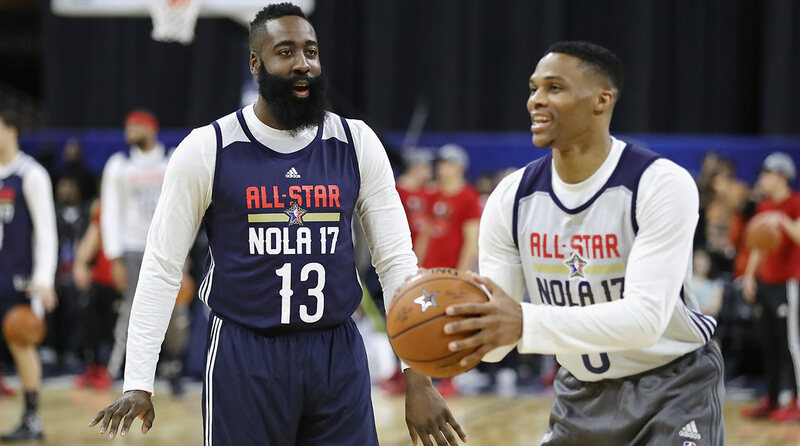 Meanwhile, former teammate James Harden of the Rockets is the –150 betting favorite (wager $150 to win $100) to win the 2017 NBA MVP award because he has led them to more wins without much help either. Without Kevin Durant, there is no doubt Westbrook has put up phenomenal numbers, averaging a triple double and a career-high 31.7 points to lead the league. But the Thunder have dropped four in a row and will likely make the playoffs in the Western Conference only by virtue of finishing over the .500 mark. And Westbrook is shooting the worst he has in the last seven years and committing a career-high 5.5 turnovers per game, two factors also hurting his chances as the +120 second choice (wager $100 to win +120). and is playing a new position in point guard. While he has committed a career-high 5.8 turnovers per game too, he is averaging a career-high 11.3 assists and 7.9 rebounds. That being said, can you imagine he and Westbrook co-existing in the same Oklahoma City backcourt today? They would need more than one basketball. Of course the Cavaliers have a pretty good player who deserves to be mentioned in the conversation as well. LeBron James might be dealing with his toughest season yet, but he has responded by posting the most well-rounded numbers of his career to keep the defending NBA champions as the team to beat in the East. James is the +600 third choice to win his fifth regular-season MVP award. Two others worthy of recognition who are long shots right now are Kawhi Leonard (+1600) of the San Antonio Spurs and Isaiah Thomas (+2000) of the Boston Celtics. Both players have been outstanding for their respective teams, but Leonard might be able to gain the most ground on the competition if his Spurs are able to overtake the Golden State Warriors for the best record in the NBA by the end of the regular season.